Water heaters can have elements with a range of wattages. 3,500 to 5,500 are commonly available. There are two elements, but only one is on at a time. Energy use in a shower includes the hot water dripping out of the tub spigot (around 1 gallon per minute) as well as water through the shower head. There have been great efforts to adopt low-flow shower heads. Equally important are leak-proof valves to divert water from the tub to the shower. OSHA recommends 140F in the water heater to kill Legionella, and 122F at the faucets to minimize Legionella growth in the pipes while also minimizing scalding (Technical Manual Sec.III Ch.7 subsection V.C.3.a). A "tempering valve" at the tank can achieve both OSHA targets, and also allows 140F for washing machine water (discussed below). The common advice to keep water heaters at 120F ignores the risk of Legionella. Frigidaire lists all their clothes dryers at 4,500 Watts. GE lists all theirs at 5,600 Watts. Samsung ranges from 5,300 Watts to 22,000 BTU/hr (6,400 Watts). Bosch lists 18,500 BTU (5,400 Watts if they mean BTU/hr) and, for the same models, 15A 240V (3,500 Watts). Roper (Whirlpool) in a 1996 flyer lists 5,400 Watts for all models, so this has been a typical level for a long time..
LG, Maytag, Sears, Siemens & Whirlpool websites do not show wattage, but require 30 Amp circuit. Clothes Washers: If you heat the water, it releases more CO2 than making the detergent. A basic 3 cubic foot washer uses 31 gallons of water. Heating half this water (for wash cycle) to 140F or 170F (see below) would release 3 pounds CO2 from a gas water heater (6-8 pounds CO2 from electric). Either dwarfs the CO2 from detergent. The most efficient washer uses 60% less hot water (12 gallons), so 60% less energy and CO2 to heat it, but still at least a pound of CO2, which is more than making the detergent. In laundries at health care facilities, CDC recommends 170F water for 25 minutes, or chemical disinfection (like bleach). They make no recommendations for residences. Professor Gerba, ABC and CBS recommend (a) washing loads which are not bleached at 140F, (b) washing underwear last, using a cup of bleach in a cold water cycle to disinfect underwear and washing machine, and (c) washing hands after touching dirty or wet laundry (2005 update). eHow adds recommendations for (d) washing linens separately, using 5-part laundry baskets to prevent cross-contamination, and (e) disinfecting the laundry basket with a spray. Ikawa and Rossen report research that bacteria in kitchen sponges are killed by 12 minutes in a washing machine at 93F (34C) with ½ cup detergent and 1½ cups bleach followed by 60 minutes in a dryer (no temperature given). Alternatives are boiling for 5 minutes, or microwaving a damp sponge in a "storage bag" for 1 minute on high. Drying alone was not effective, even in a clothes dryer. Professor LeBlanc does not report research, but recommends disposable dish cloths, or immediately washing cloths in hot water or bleach, not leaving them damp. She also recommends washing underwear separately from dish towels or dish cloths. Lysol has a manageable list of surfaces to disinfect. Wordpress cites bacteria counts for many surfaces, but gives few citations. Tide recommends monthly bleach in high efficiency (HE) washers, which lack enough water to rinse all dirt and detergent out of the machine. Tide does not claim germ-killing ability, nor recommend water temperatures, except they say almost all stains (including underwear) should be washed in warm water after pre-treating 20 minutes in liquid Tide. 7th Generation recommends cold water for all laundry, but also makes no health claims. Cheer recommends using the hottest water allowed by the clothing label and pre-treating "obvious stains," but makes no health claims. The US Energy Department and EPA recommend cold water in washing machines except for "oily stains." Perhaps that includes underwear. They have no suggestions on bleach. An Australian study says allergens are removed from bedding by 5 minutes in "detergent solutions at 25 degrees" Celsius, or 77F. In order to kill dust mites themselves, EPA found that washing in 95F water was not effective, even with bleach and detergent (D. pteronyssinus and E. maynei), but 12 minutes at 127Fdoes kill dust mites. A Connecticut study said an alternative is that 10 minutes in a 105F dryer also kills mites. Related environmental issues include: How hot can solar water get? all year? Does your detergent identify its ingredients? Are they safe for you? Which ingredients and which types of bleach are removed by sewer treatment and septic systems? If no one is sick and no one has a weak immune system, do you need to kill bacteria in underwear and dish towels? Does drying in the sun kill bacteria? all year? Nuclear and Hydroelectric power producers estimate lower emissions of CO2 than other analysts give. They have only limited explanations, which are given below. p. 10-11 will give you some more information on mines and the uranium amounts in the different processing steps. I can not give you any input numbers regarding our suppliers since we have promised not to do so. Concrete production data have been taken from the Suisse ecoinvent database and include CO2 from calcining. I cannot give you data from this database since we have bought a license and signed a contract not to disseminate single datasets. We have used steel production data (excluding the end of life recycling credit) from IISI (International Iron and Steel Institute). These data you can get for free if you contact them and tell them how you will use their data. electricity generation mixes for nations, regions etc. Generally, all emission factors for background processes (e.g. production of concrete, steel or chemicals) as well as emission factors for transport services were taken from the ecoinvent database (http://ecoinvent.org/). The database provides very detailed documentation for all modeled processes and also includes information on e.g. CO2 emissions from concrete production. p.18 shows grams of greenhouse gases for 10 categories. Is there any more detail about how these 10 numbers were calculated? For example what were the fuel and production at the ISL mine or the other upstream processes? Or the concrete, steel or money used in construction, with factors for greenhouse gases? Does the concrete include just heat, or also the CO2 released from calcining CaCO3 => CaO + CO2 ? The CO2 released from calcining is included. Check ecoinvent documentation for details. p.35 describes permanent waste storage in a mountain, and p.18 shows 0,51 g CO2e/kWh for "waste treatment." Does this number include the permanent storage? Excavating the caverns as well as mining and placing the bentonite? I assume it does not include any permanent office or guards to warn people away from the area. The number includes all aspects of the final repositories for all waste types. In addition to the excavation of the caverns and bentonite filling also the construction of storage casks as well as the construction and dismantling of an encapsulation facility is considered. The environmental impact of guards or a permanent office building is negligible compared to other activities and has therefore not taken into account. p.9 gives the number of kilometers of transmission network for two voltages, and p.25 says grid infrastructure emits 0,151 g CO2e/kWh. Is the CO2/kilometer needed for construction the same for both voltages, or what are the factors for each voltage? Emission factors are not the same for the all voltages as different materials in different quantities are used. Emission factors for the construction of transmission networks were taken from the ecoinvent database. The Swedish Hydroelectric producer, Vattenfall, uses data at odds with other researchers, to report low emissions, of 3.1 g CO2/kWh (0.007 pounds/kWh) from flooding the land. Their full study is at http://www.environdec.com/reg/088/dokument/08_waterEPD.pdf. They give the explanation indented below. The explanation cites Adams of Oak Ridge National Lab for a figure of 10,000 tonnes of Carbon per square kilometer of Boreal soil (100 tonnes/hectare). Adams' data are at http://www.esd.ornl.gov/projects/qen/carbon12.html and actually show 129 tonnes of Carbon per hectare of Boreal soil, not 100. Later figures from Oak Ridge (Houghton & Hackler 2001) say 206 tonnes per hectare in Boreal soil. Vattenfall assumes only half of their low figure of 100 tonnes does decay. Furthermore the Carbon in surface vegetation removed before inundation also needs to be counted, since it decays or burns (a small part would have been made into products which in turn are disposed of during the 100 year time frame Vattenfall uses). Vattenfall also says their reservoirs absorb CO2, through the action of algae, though a variety of researchers have measured gas exchanged at reservoir surfaces, and find CO2 being generated, not absorbed. The vegetation is removed before inundation, but there is still carbon in the ground itself and according to the ORNL database (Adams 1998), it amounts to 10 000 ton/km2 in boreal areas and 50% is assumed to degenerate during 100 years (which has been assumed to be the technical service life of the dams and water storages). Since the water flow becomes slower when building a dam there will also be an uptake of CO2 in growing biomass (algae etc) the amount depending also on latitude and in larger storages there will also be a renewed binding of carbon in the sediments after some time. " Adams, D. D. and Van Eck, G. T. M. (1988) Biogeochemical cycling of organic carbon in the sediments of the Grote Rug reservoir. - Archiv für Hydrobiologie, Supplement. 31:319-330. Adams, J. (1998) An inventory of data, for reconstructing 'natural steady state' carbon storage in terrestrial ecosystems. - ORNL, Tennessee, USA: INQUA Terrestrial Carbon Commission Resource. Axelsson, E. (1999) A life cycle assessment perspective on hydroelectric power, greenhouse gases and biodiversity. - Stockholm, Sweden: University of Stockholm; B.Sc.Thesis. Bergström, A.-K., Algesten, G., Sobek, S., Tranvik, L. and Jansson, M. (2004). Emission of CO2 from hydroelectric reservoirs in northern Sweden. - Archiv für Hydrobiologie 159:25-42. Brydsten, L.; Jansson, M.; Andersson, T., and Nilsson, Å. (1990). Element transport in regulated and non-regulated rivers in northern Sweden. - Regulated Rivers Research and Management 5:167-176. Callender, E. and Smith, R. A. (1993) Deposition of Organic Carbon in Upper Missouri River Reservoirs. - pp. 65-79. I: Kempe, S.; Eisma, D., and Degens, E. T. (eds.) Transport of Carbon and Nutrients in Lakes and Estuaries. Hamburg, FRG: Mitteilungen aus dem Geologisch-Paläontologischen Institut der Universität Hamburg; Part 6, 319 pp. (SCOPE/UNEP; v. Sonderband 74). Egerup, J. (2001) Vattenkraftens bidrag till emissioner av växthusgaser. Kalmar, Sweden: Högskolan i Kalmar; B.Sc.Thesis. Johansson, M. (1999) Turnover of organic matter in a hydroelectric reservoir - especially the carbon exchange between the atmosphere and the water. - Uppsala, Sweden: Uppsala University School of Engineering, Aquatic and Environmental Engineering; M.Sc.Thesis. St.Louis, V. L.; Kelly, C. A.; Duchemin, E.; Rudd, J. W. M., and Rosenberg, D. M. (2000 ). Reservoir Surfaces as Sources of Greenhouse Gases to the Atmosphere: A Global Estimate. - BioScience 50:766-775. Svensson, B. S. (2000) Greenhouse gas emissions from hydroelectric reservoirs - the need of a new appraisal. - Presentation made at the COP6 Conference, Den Hague, The Netherlands. Svensson, B. S.; Kyläkorpi, L., and Blümer, M. (1996). Vattenkraftens bidrag till växthuseffekten. - Pp. 21-32 I: Zuber, A. (secretary) Klimatdelegationens årsrapport 1996. Stockholm, Sweden: Delegationen för Klimatfrågor. 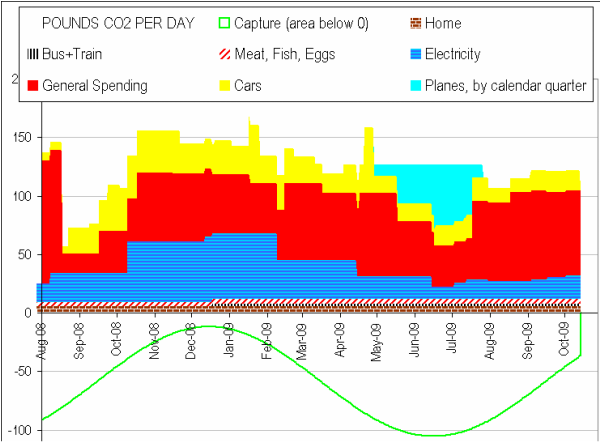 Carma.org estimates the greenhouse gases directly released by burning fossil fuels at power plants. They convert these various greenhouse gases into pounds of CO2 with an equivalent ability to warm the earth, CO2e. We increase their fossil fuel numbers to cover CO2e emitted while getting the fuel to the plant based on US ratios, and losses distributing the electricity to customers, based on US and European ratios (p.168). We add to the fossil fuel numbers some estimates of CO2e from hydroelectric reservoirs, nuclear fuel processing and disposal, and solar cell and wind turbine production (below). The US has 5 main electric grids, with much sharing inside, and little outside. CO2 output depends on your grid, not your state's plants, which may provide little of your power. For example Idaho has mostly low-CO2 hydroelectric plants, but gets over half its electricity from the Western grid, which emits much more CO2. A map of the main three grids calls them "Interconnects:" Eastern (covers from the great plains to the east coast), Western, and Central Texas (ERCOT-Energy Reliability Council of Texas). The other two grids are in Alaska and Hawaii. Solar cells need substantial energy for manufacture, resulting in some CO2e, although in the long term they could use solar energy for manufacturing and have even less CO2e. Depending on type of solar cells, and assuming they generate electricity for 30 years the CO2e to make and install cells and distribute the power is 0.06 to 0.13 pounds per kilowatt hour. If they only last 20 years, emissions would be 50% higher. Wind turbines on land need concrete, steel and some land clearance, resulting in 0.11 pounds CO2e per kilowatt hour, most of which cannot be replaced by wind-generated power. This assumes a useful life of 20 years. Wind turbines at sea might need less concrete and land clearance, but more CO2e for installation and maintenance. Wind turbines also have the environmental harm of killing birds and bats, especially along ridgetops during migrations. Wave energy: We have no data yet on the CO2e used to manufacture & maintain wave energy systems. California has summarized some environmental risks of taking energy out of waves, such as changes in location of sand, shore dwellers and bottom dwellers, Developing Wave Energy In Coastal California . Nuclear electricity creates CO2e at each step of fuel preparation and for long term defense of spent fuel. Hydroelectricity: Hydroelectric reservoirs convert some of the carbon in the area they flood to methane. Methane has 25 times as much global warming effect as CO2, so hydroelectricity which converts carbon to methane can have major global warming effects. (b) large hydroelectric dams upstream of cities have been and are military targets. For example dams on the Ruhr were attacked in World War II, and two army divisions defend the Three Gorges Dam (Guardian, Dai Qing, Sino Daily, River at the Center of the World by Winchester 1997 and 2009). The Brazilian dams used to derive CO2e here seem unlikely to be military targets, so we have not included military CO2e. If one studied dams upstream of major cities, such as the Ruhr or Three Gorges, some military CO2e could be included. Teragrams carbon per quadrillion Btu means grams per thousand BTU. Metric tonnes or mega-grams per million dollars means grams per dollar. Our footprint calculator converts all these to your choice of pounds or kilos. Our spreadsheet converts all these to pounds of CO2e, since the site was originally directed at a United States audience. We will provide metric units when possible. CO2e is reported by weight (actually mass), which is consistent from place to place. Volume (cubic foot or meter, gallon, liter) is not consistent or meaningful, since the volume of a fixed amount of CO2e varies with temperature and pressure. CO2e could be reported by the number of atoms, but the numbers would be so large they would be hard to work with. The weight of CO2e is usually estimated, not by capturing & weighing it, but by estimating (a) how much weight of Carbon was present to start with (in gasoline, wood, coal, etc. ), and (b) what percent of the Carbon combines with oxygen to make CO2e. This is typically around 99%. Each 12 pounds of Carbon becomes 44 pounds of CO2e, because of the relative weights of Carbon and oxygen atoms. The main exception happens when oxygen is scarce. If water is also scarce, then some Carbon may remain as soot. If water is present (such as an animal's stomach, and the bottom of a reservoir or landfill), then some Carbon may combine with water to make Methane: 2C + 2H2O => CH4 + CO2. Since a pound of Methane warms the earth 25 times as much as a pound of CO2, it is important to account for any creation of Methane. Weights of Methane and other greenhouse gases, such as N2O created when bacteria break down fertilizer, are usually multiplied by standard factors to reflect the amount of CO2 which would warm the earth just as much over the next 100 years. For example pounds of Methane are multiplied by 25. Then all the gases are added up and reported as a weight of CO2 equivalent. This has been done in our figures for meat, dairy, hydroelectric power, airplanes, and other topics. Some websites report data on CO2e, and some report Carbon. The weight of Carbon in CO2 is 12/44 of the weight of the CO2 (because of chemical formulas) so either works if you're consistent. "Because most fossil fuels are 75 percent to 90 percent carbon by weight, it is easy and convenient to compare the weight of carbon emissions (in carbon units) with the weight of the fuel burned. Similarly, carbon sequestration in forests and soils is always measured in tons of carbon, and the use of carbon units makes it simple to compare sequestration with emissions." A study at http://www.stormsmith.nl/ calculates CO2e from all the steps, noting the variation in energy needed to extract ores, depending on the quality of the ore. It criticizes industry studies for over-optimism. Lower estimates come from Swedish and Swiss producers, but they do not itemize their estimates in any detail. Both refer substantially to ecoinvent.org, a confidential source discussed more elsewhere. Decay. We lack estimates of the global warming from continuing radioactive decay in nuclear wastes. Guards. None of the studies includes permanently guarding or monitoring the storage of radioactive waste. Nuclear wastes are poisons, potentially attractive to terrorists or enemy states. Terrorists have existed for thousands of years and may exist for thousands more. Accidental intrusions are also a risk when people forget where the wastes are buried. With certain assumptions, principally major advances in physics, we estimate defense will only be needed for 1,000 years, so it does not add much CO2e, and the total will be 0.3 pounds per kilowatt hour With less trust in the advances of physics, and far longer needed for defense, total CO2e could be two to three times as much. Effective defense of nuclear sites would require much larger forces than they have now, with resulting increases in CO2e. The Council on Foreign Relations and Union of Concerned Scientists (UCS) note that in the US, even nuclear power plants, let alone storage sites, do not yet protect against terrorists using more than an SUV. Protection against air attack and truck bombs has been left to the military since 1967 when the Turkey Point plant was approved within missile distance of Cuba. These researchers say reactors are very strong, but spent fuel reservoirs are not. UCS notes "private security forces are going to be the only ones in a position to defend nuclear plants at all times." The Swiss nuclear producer, NOK, says, "The environmental impact of guards or a permanent office building is negligible." However small emissions per year for guards and monitors would become noticeable when multiplied by "the tens of thousands of years during which the waste will be hazardous" or "millions of years" of radioactivity (Yucca Mountain fact sheet from US Dept. of Energy). Few organizations have ever lasted 2,000 years: claimants include the Catholic church, some aboriginal groups and pueblos, and governments of China, Iran and Ethiopia. None of them could have defended poisons from all enemies for all that time. Furthermore, whatever one thinks of the notable regime changes in those countries, people who trust the government in one century would often not trust it in another century. The number of years an office and defense are needed at a nuclear waste site depend on how soon one expects an invention capable of removing the radioactivity. The physics of stopping radioactive decay or sending wastes into the sun are too advanced to plan on, but 1,000 years seems a conservative estimate. An organization capable of maintaining maps, education about risks, and defense, requires substantial resources. It also may have to move the waste. For example there used to be proposals to store waste in polar ice caps. It is hard to predict, especially about the future, but the current idea of deep mines may not last much longer than the icecaps. For the size and CO2e emissions of the office, we can consider a range of defense capabilities. Sweden spends $5.5 billion dollars per year on its military, Switzerland $2.5, Jordan $1.8. Jordan probably could not defend itself alone against a determined enemy. Switzerland probably could, but its budget does not have to cover the cost of keeping nearly all adult men available. Sweden's budget probably is enough to defend its nuclear sites. It defends other targets in the country too, so only a portion can be allocated to nuclear sites. The CO2 calculator and spreadsheet allocate $1 billion per year for 1,000 years. They use the average pounds per dollar of defense spending of eight countries, which adds only 0.01 pound per kilowatt hour to nuclear emissions. Discounting future spending can be legitimate, based on inflation and increased wealth. And current CO2e is more harmful than future CO2e, since it warms the earth longer. However it seems unwise to discount future CO2e, since CO2e emissions per person will become steadily more limited and valuable when the world population grows and other CO2e -releasing activities are invented. Even more than wind, nuclear power has other risks, aside from CO2e, including the possibility of a new regime taking over the guards.